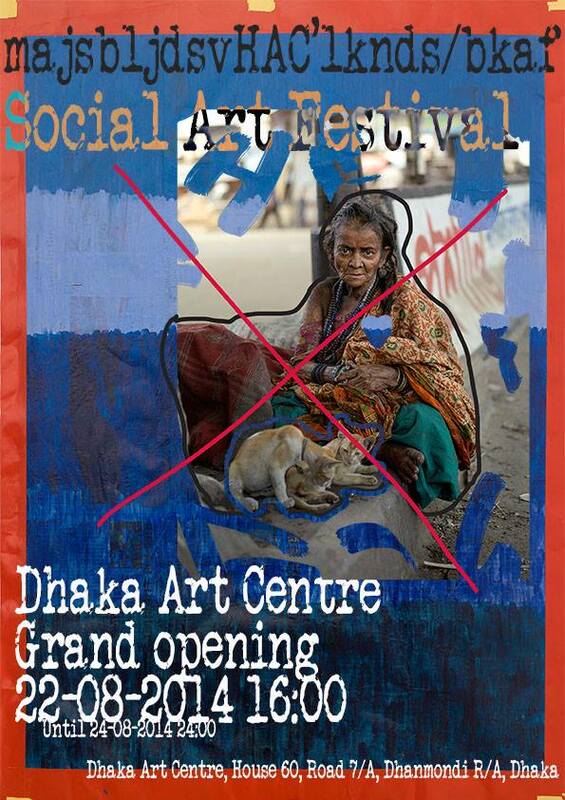 Dhaka social art festival 2014: What do you contribute to the world? A unique three month long project on social issues is taking place in Dhaka. This project has been initiated by Martijn Crowe, artist and creative director of The Faketory art studio, and artist Ronald Merkesteijn. They work together with over 50 organizations, local artists, schools and students, an orphanage house and university professors to facilitate this project. The idea is to show the world the real and complex face of Dhaka. They aim for awareness and responsibility. As soon as you know about it, you are also responsible. For the sake of telling the untold stories, Crowe works together with a group of 25 Bangladeshi artists at Dhaka Art Center, varying from painters, photographers, authors and graphic designers. They were challenged to bring their art to another depth, working with the question "What do you contribute to the world?". In this process they picked a group of people in Dhaka to make a connection with. Trina tells us: "This process has brought me closer to the bangle sellers I walked by everyday, now I know about their lives. It has changed me, and I want to invite you to do the same: See them, make a connection." They worked with bangle sellers, musicians, rickshaw drivers, homosexuals, elderly, cleaners and homeless. When they started this project, they had some kind of definition of the situation. After that they contacted these people, talked to them, met them, portrayed them. After that their ideas and definitions were changed. Also the people they worked with changed. From that experience they created art works: paintings, installations, drawings, photography, statues and stories. The 22nd, 23rd and 24th of august all the work will be displayed during the Dhaka social art festival, in and around Dhaka art centre. It will be an interactive creative experience, showcasing art, movies and performances, based on the Gespuis festival Crowe organized in Amsterdam, using the city as part of the exhibition. On the 22nd the festival will open with a procession of artists and musicians at 4 PM.